Plans to axe in-patient beds at a Northumberland hospital have been put on hold after councillors referred the decision to the government. 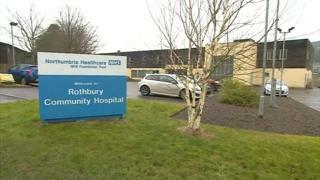 Health bosses said the 12-bed ward at Rothbury Community Hospital is under-used and should shut. But campaigners claim frail patients and families would face journeys of up to 60 miles to other hospitals. Northumberland county councillors referred the plan to the Health Secretary Jeremy Hunt. Northumberland Clinical Commissioning Group (CCG) said closure "still seems the "best option". There was applause in the chamber of County Hall in Morpeth as members of the health and wellbeing committee made its decision. Katie Scott, of Save Rothbury Hospital, said: "We're absolutely delighted. We haven't won yet, but it's a step closer to getting the beds we so urgently need back." The CCG said beds had been used "less and less" over the past few years and nursing staff could be put to better use. It said it wanted to "reshape" existing services around a health and wellbeing centre on the hospital site, which it estimates would save about £500,000 a year. Dr Alistair Blair, of the CCG, said: "Based on the evidence... closure still seems to be the best option. "However unpopular this is with the residents in Rothbury, we still need look at how we get the best value for the NHS across Northumberland."